I am not sure I have ever met a homeschool family or a farm family that did not have to live on a budget. As both, we must really watch we spend on each and every purchase. When presented with the offer to review Couponing Made Simple by Christi the Coupon Coach, I have to admit I was pretty reluctant. Our family tends to eat whole foods, which do not tend to be things you get coupons for. We also produce a significant amount of our food on the farm. Was there anything that Cristi the Coupon Coach would share that would make a difference in our bottom line? This book is really recommended for adults, but could also be added in as a great resource for high school students that are taking a personal finance elective for school. When Couponing Made Simple arrived, I read the book all the way through. There was absolutely no way that I would be able to apply everything at one time that was shared. So I decided to start taking baby steps. My first step was in just going through our mail more thoroughly and looking for any coupons that were already coming to our house free of charge. I tried to extend my view beyond immediate shopping needs and look with a 2 month vision. If we were going to need something in the next couple of months, the coupon was saved or a sale noted. My second step was to start digitally downloading coupons from our local grocery store onto my rewards card. This way I knew they were there if I happened to be in the store and didn’t bring paper coupons. I would compare the coupons on my rewards card to the weekly ad each week. I have found that I love the digital coupons because there is nothing extra to take to the store, no coupons to fall out of the cart all over the floor, and they also come off your card automatically when they expire. One less thing to declutter!! Because we do not buy processed foods at the grocery, I was mainly focussing on laundry detergents, other cleaning products, personal hygiene type items, and paper products. Now that school is approaching, back to school sales have also been a hot topic around our house. I also became much more intentional with other areas of purchasing. I felt somewhat convicted over saving money on groceries, but then not being as frugal when shopping for craft supplies, clothing, and other purchases our family needed. For example, our 13 year old just went through a huge growth spurt. He has outgrown all of his shoes. To kill two birds with one stone, I took him to get a pair of sneakers. We purchased a black pair so that they can double as church shoes until we are able to find a great deal on a $2 pair of dress shoes at our local Goodwill or at a yard sale. I have also become a member of our local Yardsale group on Facebook and Craigslist for items like this. 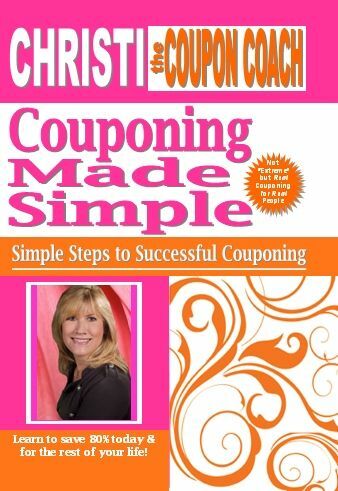 In the month since I read and received Couponing Made Simple by Christi the Coupon Coach, we have not made any investments for our new couponing adventures. It is recommended that you consider buying multiple copies of the Sunday paper. I have also heard friends mention purchasing coupons through ebay or other on-line groups. I am sure that there are savings to be had, but I really wanted to start out by doing what I could for free and keeping it simple. By using the stores digital coupons, watching fliers, and utilizing some stores willingness to price match so I don’t have to drive to multiple stores, I am proud to say that we have saved a little over $75 this month. This is certainly not the 80% off of our total grocery bill for our family of 6, but it is $75 that we may not have had previously. These savings may have also been higher if I had been willing to sacrifice our whole foods diet for processed foods, but this is something that we are just not willing to do in the name of saving a dollar. Christi mentions using on-line coupon sites to help you find even more deals. My hope is that she would consider sharing just a couple of the tried and true sites she has used as a starting place in a future edition of this book. This book was truly an inspiration. An inspiration to try some new things, but also to re-energize myself to start doing things once again that used to be common practice. I also found a sense of satisfaction in knowing that there were many money savings strategies that we already employ that have lead us down the road to savings. An affirmation of what you are doing right has a lot of value in its own rite. On a personal note, I believe that God calls us to be good stewards of the financial resources He provides to us. For this reason, I do support couponing and other money saving strategies. I feel that when I use these methods, I am being a good steward, but I am also discipling my kids in proper money management practices. However, I also see many women that get so addicted to getting the best deal at all costs that couponing and saving can become their god. Families are found going without dinner because mom is on the computer tracking down the best deals. Are you really saving if you spend all afternoon getting the best deals, but then have to turn around and buy take out on the way home because isn’t ready? We are also called to be stewards of our time. I really got the sense from Christi’s writing that she is supportive as well of “everything in moderation”. A great deal is a great thing as long as the end cost to your family is not excessive. Thanks, Cristi the Coupon Coach, for an inspirational and informative book. As always, check out what other crew members have to say by clicking on the review box below.